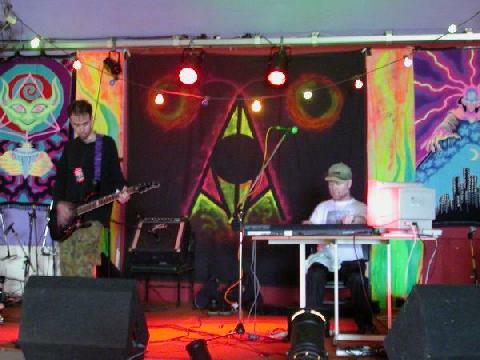 A rare chance to see Alien Dream at the Barn stage was not missed! Those who have the first album "Alien Dream" will know what sort amazing music was to be had. Michael Blackman jetted in all the way from Australia to play live, and it was noted as one of the high-lights of the festival especially as he was accompanied by Tom Byrne, the musician responsible for several albums which I discussed with him at length later. The barn area seemed to be typically uncrowded but as Alien Dream played it soon filled, and the strange, almost alien music that drifted about caught many people's attention. The set list was as follows: Brainscan (festival mix), Alien Dreamscape, Moons & Stardust (festival mix), Aqua Gardens, Journey, Microscope and Forever Tomorrow. Tom also played two of his solo tracks "A Short Life", dedicated to his son, Gerard, who died in 1999 aged only 12 - a very sentimental and emotional piece and the last section of "Part One" of the The Eye of the Cyclone. The music was available for sale and I was fortunate to get Alien Dream's limited edition festival EP number 3 of 100, and Tom's solo cds The Last Druids and The Eye Of The Cyclone (see Aural Innovation reviews on these excellent albums). I spoke to Tom afterwards who said he was pleased with the performance and the audience's reaction. Later Tom told about his interests in prog rock and the rich vein of ancient history which he is interested in. "I thought I would do a series of albums that were inspired by those aspects of Britain that weren't terribly well known - "The Last Druids", focusing on those characters we know about from the fragmentary histories of the time, "The Eye of the Cyclone", a personal expression of the theology they may have had, as documented in the Barddas (alleged transcriptions of an ancient oral tradition). The next album in this series, "Einigan Gawr" will deal with the origins of these beliefs - it's my attempt to write an epic poem and put it to music. I've written the poem, now the mental exercise of setting it to music begins!" Tom is very busy and has another album due out soon too. "The Howling Tower" is a stand alone digression, a single concept album of an atmospheric story that impressed him when he read it as a teenager. From the sneaky preview samples he sent me, I can tell you its going to be a classic, a well orchestrated album as good as The Last Druids. And as his son Matthew got some rather good feedback at the festival drum workshop, Tom might persuade him to play drums for the album. Tom also told me that Michael should be working on the fourth Alien Dream album by now - so watch this space.